Can we just call it summer already? I realize that half the continent is still covered in snow (*looks out window, sighs*) but how about we just invoke the spirit of summer with the traditional hallmarks, like bright, shiny sci-fi movies with A-list actors, and the impending start of the NHL playoffs, and call it a done deal? So yeah, let's just call Oblivion the start of the season already. Tom Cruise stars in it as a resource hunter on a post-apocalyptic Earth, ravaged by a war against aliens that we “won”, but still required us to leave for a space colony. On one of his trips back, Cruise's character discovers that the abandoned planet may not be so abandoned after all (which I mean, you've guessed, since why else is Morgan Freeman on the poster?). Cue the pitched battles on land in the sky, and conspiratorial conversations as the truth begins to be revealed. There's a couple of main selling points to this film, primarily among them being the beautiful looking FX shots by director Joseph Kosinski (late of TRON: Legacy, which made no goddamned sense but was at least nice to look at). Jumping around to various ex-landmarks, Planet of the Apes style, is a heck of a hook, as is the mystery teased in the trailers and commercials. There's a mix of the slick and the grungy in this, and as post-apocalyptic wastelands go, it's a pretty one to look at. Then there's Cruise, though he's not as much of a sure thing as people might imagine. In fact, his 2012 was actually kind of difficult, with Rock of Ages out and out bombing (though he gets to spread the blame around for that one) and Jack Reacher making only a modest $80 million. You could blame this on residual animus from the public for his couch-jumping, but that was years ago now, and I'm more likely to put this on him being 50, and no one remaining a giant box office star for three decades unscathed. What this does indicate, though, is that Cruise is really only a draw in the right kind of role – and he still has a few decent-sized hits to lean on from the last decade or so. 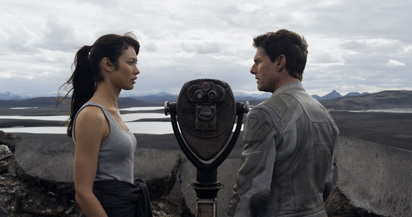 Oblivion looks to be this right kind of role, and shares a passing similarity to Minority Report and War of the Worlds, albeit without the Spielberg connection to sell extra tickets.